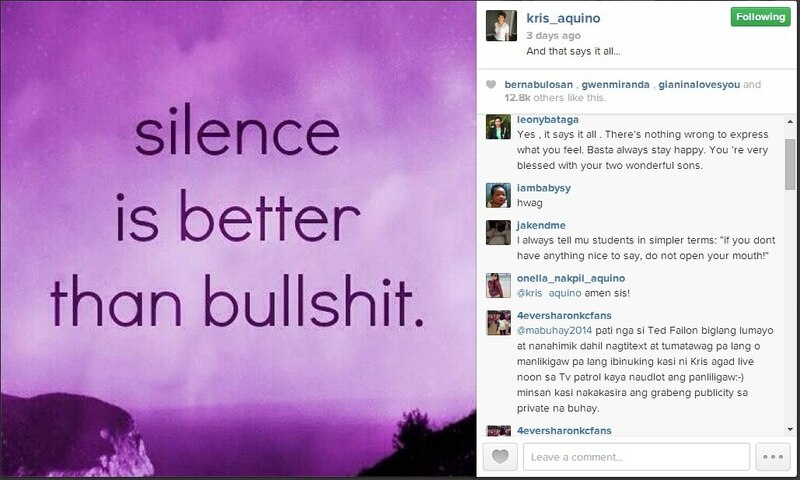 Kris on silence: "There is peace in keeping quiet kasi"
Instead of opening her heart and mind anew just like she used to, Kapamilya star Kris Aquino opts to do the opposite by keeping her mouth shut. 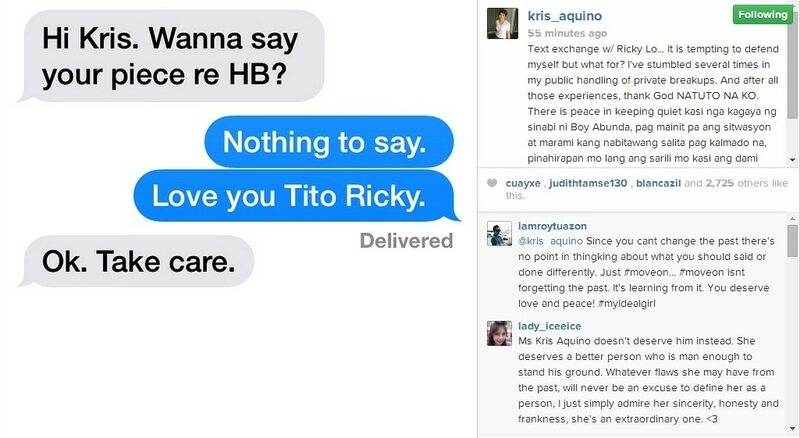 The Kris TV host on Monday explained how she has arrived at such decision by posting on her Instagram account the text exchange she had with veteran columnist Ricky Lo. "It is tempting to defend myself but what for? I've stumbled several times in my public handling of private breakups. And after all those experiences, thank God NATUTO NA KO" she began. Kris say she realized that silence could be beneficial for her at this point in her life. She reasoned,"There is peace in keeping quiet kasi nga kagaya ng sinabi ni Boy Abunda, pag mainit pa ang sitwasyon at marami kang nabitawang salita pag kalmado na, pinahirapan mo lang ang sarili mo kasi ang dami mong kailangan walisin at ayusin. At 43 years old, finally learning when it's best to just keep my mouth shut." Quezon City Mayor Herbert Bautista recently admitted on National TV that he "loved" the Queen of All Media and that they were actually in a relationship. Unfortunately, according to him, it had to be cut short due to his kids. While Kris didn't react on the interview, she posted a meaningful quote on her Instagram account a few hours after the said segment aired. During the wee hours of June 7 though, Kris indulged her Instagram followers a short Q&A and among the topics that she answered was one about her tandem with Herbert which many fondly called KrisTek. She addressed a commenter's question asking if there&#8217;s a chance for their tandem to rekindle it's romance with: "HB is a friend, medyo may distance but still a friend. And from your comments you seem to really care for me- I'm touched! Thanks for the concern & good wishes."